Alexandre Burrows took the reigns for the top-seeded ’10-’11 Canucks in Game 1 as he scored twice to lead them to a 4-2 win. In Game 2, the 5th-seeded ’09-’10 Canucks held a 2-0 lead just 5:19 into the game. Mikael Samuelsson scored one of the goals and then he added an insurance marker late in the third period to lead the ’09-’10 Canucks to a 3-1 win. Then, the two teams were tied 1-1 going into the third period of Game 3. Mason Raymond broke the stalemate a little over eight minutes into the period to give the ’10-’11 Canucks a 2-1 lead. However, the ’09-’10 Canucks tied it about six minutes later thanks to Henrik Sedin. Ryan Kesler made his first mark on the series with a PP goal with three minutes left in the third to give the ’10-’11 Canucks, which would be the game-winner. Daniel Sedin potted an empty-netter to complete a 4-2 win for the top seed. 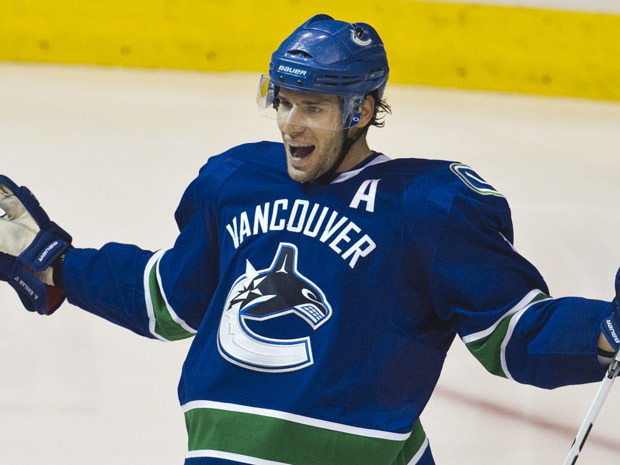 Kesler would then net a hat trick in Game 4 as the ’10-’11 Canucks held on for a 4-3 win and a 3-1 series lead. Kesler registered a second straight game with a hat trick in Game 5 as his three goals led the top seed to a series-clinching 5-2 win. Up next in the other Semifinal matchup is the 6th-seeded ’92-’93 Canucks and the 7th-seeded ’01-’02 Canucks! This entry was posted in Qualifying Tournament, Ultimate NHL Playoff and tagged Alexander Edler, Alexandre Burrows, Christian Ehrhoff, Daniel Sedin, Henrik Sedin, Kevin Bieksa, Mason Raymond, Mikael Samuelsson, Qualifying Tournament, Roberto Luongo, Ryan Kesler, Ultimate NHL Playoff, Vancouver Canucks. Bookmark the permalink.